Porter proposes that the connection that Addison drew between the French romances and the porcelain is worth paying attention to—perhaps the novels that porcelain-buying women read might illumine those women's love of porcelain. In the 18th century, Porter reminds us, norms of appropriate behavior for women became increasingly conservative. Women's access to commerce and politics was declining. Publishers churned out courtesy manuals that taught women how to live submissively in the private preserve. In this context, the "feminine" and the "Chinese" mutually constructed each other. 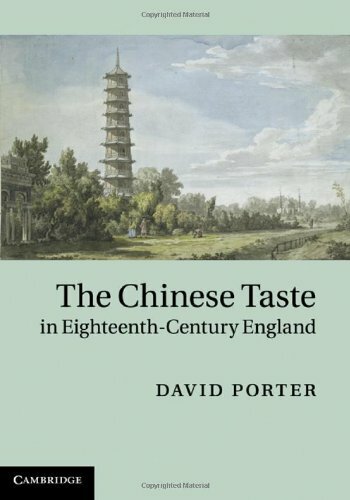 Porter investigates the relationship of femininity and Chinese decorative arts from many angles: literary narratives variously depicting women as porcelain-shoppers in the public square and tea-pourers at the hearth; the visual links English engravers created between teapots and breasts; the resonance between Chinese garden rocks and the practice of gossip. Underpinning all of these inquiries is his reading of a central figurative trope in Ming porcelain. Some of his readings, Porter concedes, are speculative. There were moments when, encountering a provocative claim at the beginning of a chapter, I raised an eyebrow, cleared my throat, and prepared to doubt. Yet every one of his arguments is compelling—and it is a testimony to his patience, carefulness, and creativity that most are persuasive. I am at the Metropolitan Museum of Art. I am looking at a porcelain dish, white, painted with peonies. It seems like so much ephemera: a teacup, a plate. This very ephemerality was part of what 18th-century critics derided. And this ephemerality is part of what has kept scholars' attention, by and large, turned from porcelain to matters of more obvious importance. But Porter suggests that porcelain had cultural power not despite but through its ephemerality: women could purchase a vase depicting a scene of female friendship and dignity, and no one really noticed. It was, after all, just a vase. Of course, there is no "just a vase." As Porter concludes, "certain kinds of objects can … play an unexpectedly significant role in the evolution of sensibilities." And in the working out of politics, international and domestic, too. Lauren Winner is an assistant professor at Duke Divinity School. For the academic year 2010-11, she is a visiting fellow at Yale's Institute for Sacred Music. She is the author most recently of A Cheerful and Comfortable Faith: Anglican Religious Practice in the Elite Households of Eighteenth-Century Virginia (Yale Univ. Press).